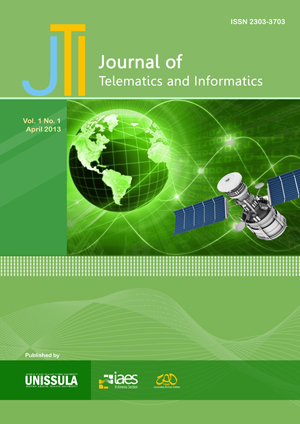 Journal of Telematics and Informatics (e-ISSN: 2303-3703, p-ISSN: 2303-3711) is an interdisciplinary journal of original research and writing in the wide areas of telematics and informatics. The journal encompasses a variety of topics, including but not limited to: The technology of sending, receiving and storing information via telecommunication devices in conjunction with affecting control on remote objects; The integrated use of telecommunications and informatics; Global positioning system technology integrated with computers and mobile communications technology; The use of telematic systems within road vehicles, in which case the term vehicle telematics may be used; The structure, algorithms, behavior, and interactions of natural and artificial systems that store, process, access and communicate information; Develops its own conceptual and theoretical foundations and utilizes foundations developed in other fields; and The social, economic, political and cultural impacts and challenges of information technologies (advertising and the internet, alternative community networks, e-commerce, e-finance, e–governance, globalization and security, green computing, ICT for sustainable development, ICT in healthcare and education, management and policymaking, mobile and wireless communications, peer-to-peer learning, regulation of digital technologies, social networking, special user groups, the 2.0 paradigm, the WWW, etc). The journal is a collaborative venture between Universitas Islam Sultan Agung (UNISSULA), Universitas Ahmad Dahlan (UAD) and Institute of Advanced Engineering and Science (IAES) Indonesia Section. We announce that you can publish your research paper in Journal of Telematics and Informatics (JTI, ISSN: 2303-3703), an interdisciplinary journal of original research and writing in the wide areas of telematics and informatics. The JTI is a peer reviewed International Journal in English published four issues per year (March, June, September and December).